Carb Killa combines a thick layer of caramel, over a soft, chewy, base filled with crunchy "crispies" all coated in milk chocolate. Containing less than 2g of sugar, making the bar itself 215 calories. This bar really is the perfect high protein snack. Delivering over 22 grams of protein per bar, Carb Killa is a high protein bar that has been designed to provide balanced complete sources of protein, while limiting the level of simple, processed refined sugars. flavours, fat reduced cocoa, salt, emulsifier (soylecithin). Grenade® Carb Killa should be consumed as part of a balanced diet. Product contains more than 10g/100g polyols: excessive consumption may produce laxative effects also may contain gluten, nuts, peanuts, sesame seed. 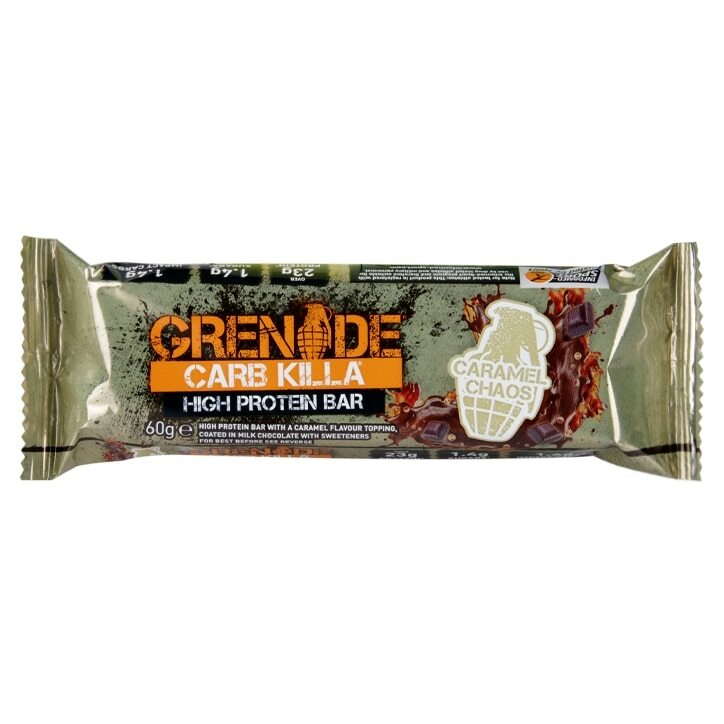 Grenade Carb Killa Bar Caramel Chaos is rated 4.7 out of 5 by 29. Rated 4 out of 5 by Madonna99 from Gorgeous I have a very sweet tooth and find it hard not to eat chocolate, these bars however are a much healthier alternative to normal chocolate bars...….yummy, you would never know they are healthier though as they taste wonderful! I bought them on 3 for 2 which made them better value as they are expensive. Rated 4 out of 5 by Becky1993 from Great Bar Probably my second favourite flavour. Great snack, high protein and delicious, what more could you want! Rated 5 out of 5 by sheryafo from grat taste I tried this flavor before , and I order it again . and I will order it again when it finish. Rated 4 out of 5 by Boopie from Simply delicious This caramel bar is probably the Grenade bar I purchase the least, however it still beats so many other brands. If Grenade didn't have so many other amazing flavours I would probably stock up on these like crazy. Lovely and soft caramel with a great texture from the crispy pieces layered on top. Tastes like a real treat and really motivates me through my workouts knowing I can indulge myself with one of these afterwards.